Along with the American Dental Association, we recommend bringing your child in for their first visit by their first birthday. To maintain good oral health, your child should see us every six months thereafter. Regular visits are vital to check for cavities and possible developmental problems. Normally, the first tooth erupts between 6 and 12 months of age. Because of this, your child’s gums can become sore, tender, and irritable up until age 3. Rubbing sore gums gently with a clean finger, the back of a cold spoon, or a cold wet cloth can help ease this process. Teething rings work well too, but avoid teething biscuits which contain cavity causing sugars. While your baby is teething, it is also important to monitor their teeth for signs of baby bottle decay. Examine their teeth and sides of the tongue, every two weeks to check for dull spots (whiter than the tooth surface) or lines. A bottle containing anything other than water that’s left in an infant’s mouth while sleeping can cause decay. The sugar in baby milk mixes with bacteria in dental plaque, forming acids that attack and deteriorate the tooth enamel. Each time a child drinks liquids containing sugar, acids can attack their teeth for the next 20 minutes. When awake, saliva carries away the liquid. But during sleep, the saliva flow decreases and liquids can pool around your child’s teeth for long periods and cause decay. 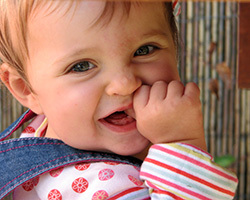 The primary or "baby" teeth play a critical role in dental development. Without them, your child couldn’t chew food properly and may have difficulty speaking clearly. Primary teeth are also vital to development of the jaws and the guiding the adult teeth into proper position around age 6. 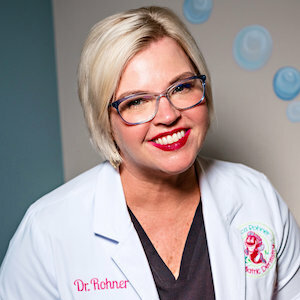 Since primary teeth guide the permanent teeth into place, infants with missing primary teeth or infants who prematurely lose their primary teeth may require a space maintainer. This device is used to hold the natural space open. Without a space maintainer, the teeth can tilt toward the empty space and cause permanent teeth to erupt misaligned. That’s why the way your child cares for their primary teeth plays a critical role in how their permanent teeth develop. 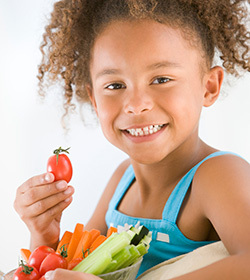 Your child’s teeth, bones, and soft tissues require a healthy and well-balanced diet to avoid the appearance of cavities and other dental problems. Many snacks that children eat regularly can cause cavities. Therefore, it’s important to encourage your child to choose only healthy foods like vegetables, and low-fat yogurt and cheeses, which all promote strong and healthy teeth. Your child’s teeth actually start forming before birth. As early as 4 months of age, the primary teeth will begin to push through the gums. The lower central incisors are first, followed by the upper central incisors. The remaining 20 primary teeth typically erupt by age 3; but the place and order can vary from child to child.